We have our first galleries of 35-Year Reunion photographs ready for visitors — we have THREE galleries ready for you! 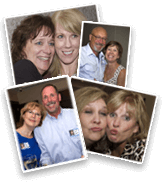 Click this to see Gallery 1 from the October 1, 2016 party and then click this to see Gallery 2 which will leave you hungry for more and ready to view Gallery 3. Big thanks to Rob Heinly and Kevin Webb (and anyone else!) for snapping these pics for us! Do you have some pics you’d like to share? Click this to send us an email note and we will guide you through the process to submit all your photos.